Applications are now open for our 2019 summer fellowship program. Curious about a digital career? Interested in government service? Want to make a difference for the City of Boston? We have more information about our fellowship, and how to apply, on our summer fellowship page. You can also jump right to our online application. Jiaorui Jiang, a Bentley University student, worked with us to develop wayfinding and signage designs for the Freedom Trail. Examples of current Freedom Trail signs, some of which are dark and hard to read. Through user research, Jiaorui was able to figure out why some visitors become confused when navigating the tourist attraction. She then helped design and test signage for visitors that unified the 16 sites along the trail through one common brand. With her help, we were able to sketch out a more useful wayfinding system for tourists. Working with the Freedom Trail Foundation, we’ll be able to make use of these suggestions as they update the Trail’s presence in the City. Emily Quinn, a senior at Emerson, helped prepare a content library of social media posts for the Digital Team. A snapshot of our social media content library. Why build a content library of social media posts? Because they benefit departments across the City. Our content library is a resource of “evergreen” content — information that is useful year-round. Staff members are able to easily push out information without wasting time. Some great examples of evergreen content include all of our winter and emergency information. The City can now quickly publish posts about storms and floods while also handling public safety issues. Caroline Trier, a Washington University graduate, took on the redesign of the My Neighborhood Resources page on our old website. This application is in desperate need of a rebuild. We also wanted to research what it is people wanted out of this tool. 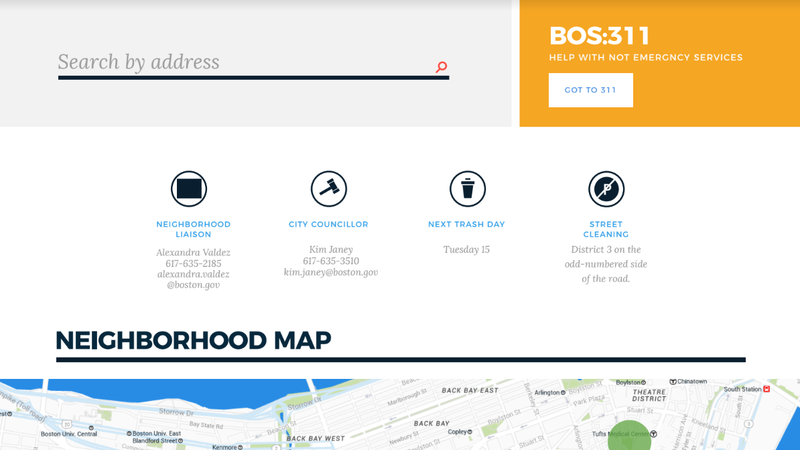 A mockup of the redesigned My Neighborhood Resources page. Caroline’s redesigned page would surface resources and services based on a user’s address. She wanted to set up a system to help people navigate City information and services in a more personalized way. As part of her work, Caroline tested her prototype at eight different events inside and outside of City Hall. Thanks to her work, we are getting ready to start developing this application in the new year. Molly Trowbridge, a UMass Amherst student, tackled the project of migrating Imagine Boston 2030 into Boston.gov. 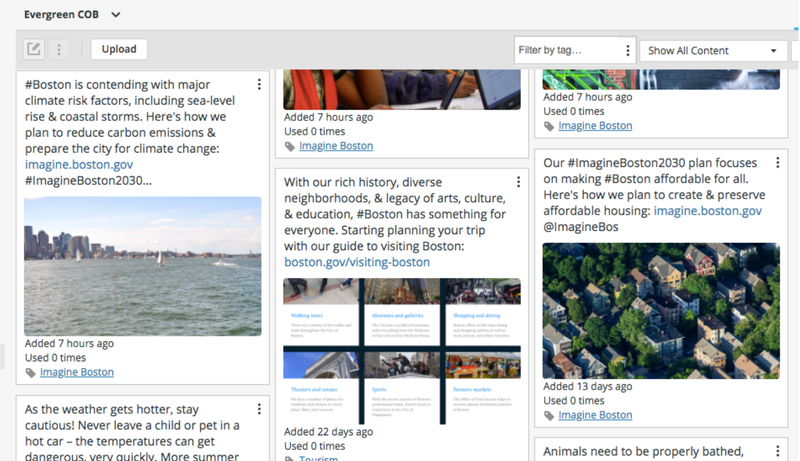 The top of the new Imagine Boston 2030 website. By breaking up the Imagine Boston 2030 report into relevant sections, Molly added a narrative flow to the overall page. Now, a person can explore the site based on their interests to help get a better understanding of the City’s plan for the future. Aside from this project, Molly helped Food Access with new program pages targeting low-income families. She also added numerous events to the City’s calendar, and helped manage the day-to-day maintenance of Boston.gov. Wes de Silvestro, a Harvard student, helped us with our efforts to create an online tool for ordering birth certificate. 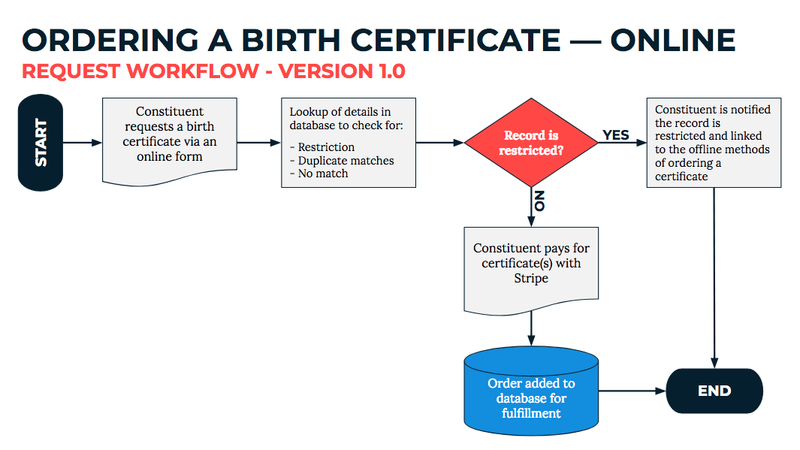 A snapshot of the birth certificate product plan. After launching our death certificates online purchasing application, we wanted to explore the potential for birth certificates. While it might seem easy, birth certificates have their own specific considerations. The process just isn’t as straightforward as death certificates. As part of his project, Wes developed a product plan and built a workflow for the future. His efforts helped create a foundation for the project that we are building on today. The City’s Analytics Team also has a summer fellowship program. If you love solving problems related to data, this opportunity might be perfect for you.